Most of us have experienced disaster — or know someone who has. Conversely, most of us have experienced great blessing as well. While we are grateful for God’s kindness, we can’t help but shake our heads and wonder at the evil in this world — a world our Maker once called “very good.” We are even tempted to wonder about the wisdom of God’s plan. The Providence of God is an antidote to such temptations. In this series, R.C. 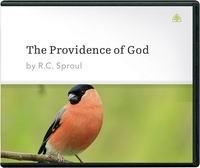 Sproul brilliantly shows the wisdom and power of God’s rule, clarifying how God can guide all events without initiating human wickedness or destroying human freedom. And he explains how your prayers are a crucial part of executing God’s plan. The Providence of God astutely discloses how God moves the planets’ paths — and your life’s steps.